Christ healing the paralytic at Capernaum by Bernhard Rode 1780. Healing the paralytic at Capernaum is one of the miracles of Jesus in the Gospels in Matthew (9:1–8), Mark (2:1–12), and Luke (5:17–26). Jesus was living in Capernaum and teaching the people there, and on one occasion the people gathered in such large numbers that there was no room left inside the house where he was teaching, not even outside the door. 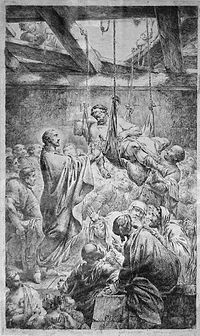 Some men came carrying a paralyzed man but could not get inside, so they made an opening in the roof above Jesus and then lowered the man down. When Jesus saw their faith, he said to the paralyzed man, "Son, your sins are forgiven." Some of the teachers of the law interpreted this as blasphemy, since God alone can forgive sins. Mark states that Jesus "knew in his spirit that this was what they were thinking in their hearts." (2:8 Jesus said to them, "Why are you thinking these things? Which is easier: to say to the paralytic, 'Your sins are forgiven,' or to say, 'Get up, take your mat and walk'? But that you may know that the Son of Man has authority on earth to forgive sins …" He says to the man "...get up, take your mat and go home." (8-11). Mark's Gospel states that this event took place in Capernaum. In Matthew's Gospel, it took place in "his own town" which he had reached by crossing the Sea of Galilee, while Luke's Gospel does not specify where the miracle occurred. Wikimedia Commons has media related to Paralytic lowered through the roof. This page was last edited on 7 November 2018, at 16:08 (UTC).